Engineering expertise from Queen’s is playing an important role in the development of the next generation of aircraft engines for Rolls-Royce and creating high value research jobs in Northern Ireland. Frank Kirkland, Rolls-Royce Chief Designer in Civil Aerospace, on a visit to the team at Queen’s, said: “The work which the team here at Queen’s is carrying out supports Rolls-Royce's aim to deliver more efficient engines when we’re designing for the future. The relationship between Rolls-Royce and the leading quality team at Queen's has helped to develop the team with world-class knowledge and capabilities which have bolstered other areas of the Northern Ireland economy. He said: “It’s great to see relationships between the University and innovative companies like Rolls-Royce evolve over the years. “These global leaders drive technology change because they strive to make their products better and better in a highly competitive market. 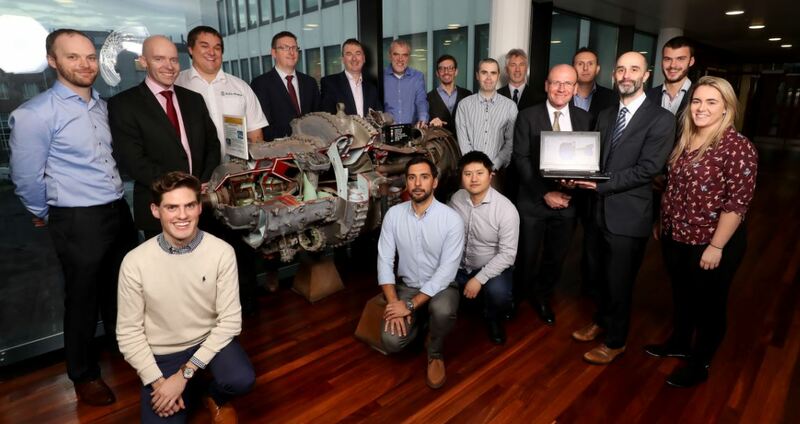 Photo: Frank Kirkland, Rolls-Royce Chief Designer in Civil Aerospace, fifth from right, with Rolls-Royce colleagues and the team from the School of Mechanical and Aerospace Engineering at Queen’s University.